जब श्रीरामभद्र आचार्य ने अपनी अंतर्दृष्टि से ‘मानस’की त्रुटियों को जान लिया तो प्रत्यारोपों का जबाब भी उन्हें देना होगा,वैसे त्रुटियों का जिक्र तो करपात्री जी महाराज से लेकर पंडित ज्वालाप्रसाद ज्योतिषी भी स्वीकार कर चुकें हैं और जिसे शक हो वह इत्मीनान से सांगोपांग अध्यन करे,त्रुटियाँ उसे जरुर देखेंगी.किसी भी लोकिक साहित्यिक कृति को ज्ञान मञ्जूषा ही माने.उसे अलोकिकता का आवरण उड़ाओगे तो सचाई की हवा के एक झोंके में खुद भी उड़ा दिए जाओगे..
स्वयम goswami tulsi baba kh gaye हैं bhasha bhanit mor mati thori……. Just to shed some more light. There is something called a “critical edition”. From http://en.wikipedia.org/wiki/Textual_criticism – the objective of a critical edition is identification and removal of “transcription errors”. Given a manuscript copy, several or many copies, but not the original document, the textual critic seeks to reconstruct the original text (the archetype or autograph) as closely as possible. A critical edition of the Mahabharata was published by Bhandarkar Oriental Research Insitute, Pune (http://www.bori.ac.in/mahabharata.htm) in 1966. A critical edition of the Valmiki Ramayana was prepared by the Oriental Institue, M S University, Baroda during 1960-1973 (See http://en.wikipedia.org/wiki/Maharaja_Sayajirao_University_of_Baroda#Oriental_Institute). This is precisely what Jagadguru Rambhadracharya has done for Ramcharitmanas. If critical editions can be made for Valmiki Ramayana and Mahabharata, why not for Ramcharitmanas? I have personally seen multiple editions of Ramcharitmanas – including Gita Press, Motilal Banarsidass (this one has eight Kandas), and some other old editions. The number of differences in the various editions is enormous. The Jagadguru has studied all these differences from various editions and tried to come up with a new edition. This is reconciliation of numerous printed editions of the Ramcharitmanas, which has already been done years ago for Valmiki Ramayan and Mahabharata. Surely, one is free to agree or disagree with the arguments made and the verses printed in this edition, but this is in no way a blasphemous act of “changing” the Ramcharitmanas or “finding faults with it” as some sections of the media are trying to present it. If at all, it is finding errors with the scribes and some manuscripts that are in existence (given multiple editions, some are bound to be wrong). Jai Shri Ram to all. मानस मर्मग्य राम भद्राचार्य एक महान धर्मात्मा हैं, अतुल्य रचनात्मक यह धर्मात्मा कभी किसी का गलत नहीं कर सकते आप शायद रामभद्राचार्य को नहीं जानते जन्म से नेत्र हीन रामचरित मानस के साथ सभी वेदपुराण कंठस्थ याद रखने वाले संस्कृत के प्रकांड विद्वान् अपना संपूर्ण जीवन विकलांगों को समर्पित करनेवाले देश का एकमात्र विकलांग विश्वविद्यालय स्थापित करनेवाले ९ कम्प्यूटर के सामान तेज़ मस्तिस्क वाले को भला सस्ती लोकप्रियता की क्या जरूरत | ऐसे महान संत को कलयुग मैं ऐसा दिन देखना पड़े तो बहुत दुःख होता है| यह नया ग्रन्थ अगर उन्होंने लिखा है तो शायद यह उनकी अत्यंत रचनात्मकता का परिणाम हो सकता है | हमारी संस्कृति के साथ हमारे संतों को अनावश्यक रूप से बदनाम करने की साजिश चल रही है, हमें इन संतों पर भरोसा करना चाहिए और कुछ भी आक्षेप किन्ही संदिग्ध उकसानेवाले लोगों की बातों मैं आकर नहीं लगाना चाहिए | एस ऐ आस्थाना जी सही गलत क्या है यह तो मैं नहीं जानता लेकिन हमें संतों का सम्मान करना चाहिए यही हमारी संस्कृति है, पहले राजा महाराजा भी श्राप खाने के बाद भी संतों के प्रति अपनी विनम्रता बनाये रखते थे इस महान संस्कृति की विरासत को सँभालने की जिम्मेदारी आपकी भी है. kuch log hote hain jo sury ke upar thukna ka prayas karte hain pur ve sury me na jakar unhi ke upar girta hai aise logo ka kaya kiya jai? you guys just need to rake up some useless issue. 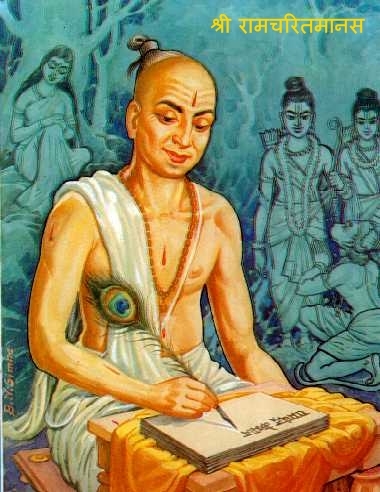 I thought people use to follow valmiki Ramayana?Now you are raking an issue over Ramcharitmanas(which nobody follows in any case), which itself was an edition of valmiki ramayana by Tulsidas(so if bhadracharya did it whats wrong in that?). man you people are such big hypocrites. Also you people need to learn someone’s opinion about the epic.Had he said anything bad about the characters/portrayed the characters differently(though nothing bad in that also) still the protest would have some legitimate point. So if i tell a story today to someone that Rama blessed my village( which didn’t happen according to any of Ramayana) will you hang me?